WILLEMSTAD - On Wednesday, August 29, 2018, the Faculty of Social and Economic Sciences of the University of Curacao, Dr. ir. Moises da Costa Gomez (UoC), the Tax Law and Economics assessed positively by NVAO, concluded with a festive celebration. Partly with support and under the guidance of Prof. Dr. Peter Kavelaars from the Erasmus University and Professor of Tax Law at the UoC, Paul Cornelissen from the Fontys Hogeschool and Ms. Ivy Doorstam from the UoC, a final group of 22 students has successfully completed the positive assessed HBO Fiscal Law and Economics-training of the UoC. For the completion of the study program, the students had to carry out research on an up-to-date tax issue in a thesis. Then they had to defend their thesis in the presence of a graduation committee consisting of an internal tax specialist as well as experienced external experts from three local tax consultancy firms, the tax authorities and the Ministry of Economic Affairs. 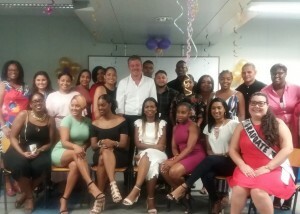 The management of the University of Curaçao and the Faculty of Social Sciences, in particular, are very satisfied with the results achieved by these students and are very grateful for the cooperation of everyone involved in the graduation of this group of students.